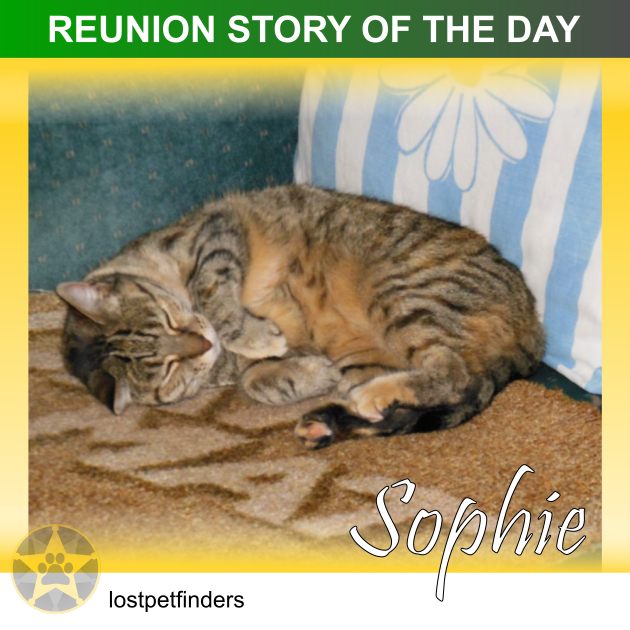 "Sophie was an abandoned stray who had a brother who seemed to look after her best he could under such conditions. We worked out they mainly lived by a chook house in the street behind us in Massey. Sophie's brother (who we later named Louis) started arriving at our house in the mornings and I started feeding him. Sophie only came out at night so I would put her food out when she arrived each night. After we managed to get Louis to the vet he lived inside but Sophie was too frightened to join him so we bought her a kennel to live and sleep in and placed it outside our lounge glass door facing us. After having Louis for three years he died from AIDS and leukemia. Sophie looked for Louis up to a year as she adored him. Luckily she had started to come inside a few months before Louis' death and eventually I was able to pat her. If anyone came to our house she would run and hide for hours. Just before our move to Ranui she had her first visit ever to the vet which was traumatic for her and then the move on top of that caused such stress that she wouldn't eat for three days. After being in the new home for two and a half weeks she was spooked by a gas repair man and accidentally got outside. By week three there were days when I felt like collapsing with grief. We lost interest in unpacking and settling in the new house and lying in bed at night hearing the wind and the rain made us worry if she had shelter. My days were spent putting flyers in letter boxes all over, taking posters of her into places that had noticeboards, joining social media and stopping people walking dogs to give them a poster (dog walkers see a lot when out walking and walk at night also). Last Saturday afternoon I was driving down a busy main road to start putting flyers in a street in Ranui when I saw a small greyish cat just about get run over and I thought it could be Sophie so after the cat ran back into a driveway I quickly ran into the area calling her name when a nice elderly man asked me was I looking for a cat, so I told him the story and that Sophie had been now missing for six weeks. He told me I probably saw his neighbour's cat which was a small grey tabby, so I left thinking it wasn't her after all. I went and distributed the flyers and went home but for some reason I don't even know why but I wanted to leave the last flyer I had left in the elderly man's neighbour's letter box in case the cat I saw wasn't the cat the elderly man said it was and that Sophie might be in the same area. I was just about at the elderly man's house when I saw Sophie coming out of the drive. I slammed the brakes on and ran in calling her name and there she was looking up at me and meowing (Sophie very rarely meows). She was so pleased to see me. She was frightened and miserable. I phoned the West Auckland Cat Rescue lady who came with a cat trap but to my horror the trap did not go off when Sophie reached near the end of the cage where the food was. I went home so disappointed but Sophie knew I was there for her now. I took plenty of food back that night so she wouldn't risk crossing the main road in search of food and gave her my cardigan and one of her blankets to sleep on where she had obviously been sheltering in a little shed like building under a porch. Next morning I had to place her food halfway in the cage. To my relief she was in the same place and was eating the food in no time. At five that night I was to meet the cat rescue lady again (a wonderful and amazing lady) and there Sophie was again in the same place. This time we had a more sensitive trap. Because Sophie is so scared of people I had to take the trap and set it myself next to where she had been sheltering. To my relief Sophie was in that trap straight away eating the food and the trap door went down once she was near the end of the cage. When I got her home she was skinny but oh so happy and our pain was over. Sophie had got badly lost. During all this I was amazed how people would stop to talk to me in the street when I was putting flyers out - wanting to help by looking out for her and wanting to know what Sophie looked like.